Cocaine trafficking horrors: Users are complicit in the atrocities of the drug trade. The gruesomeness of the drug trade rivals any atrocities in history. 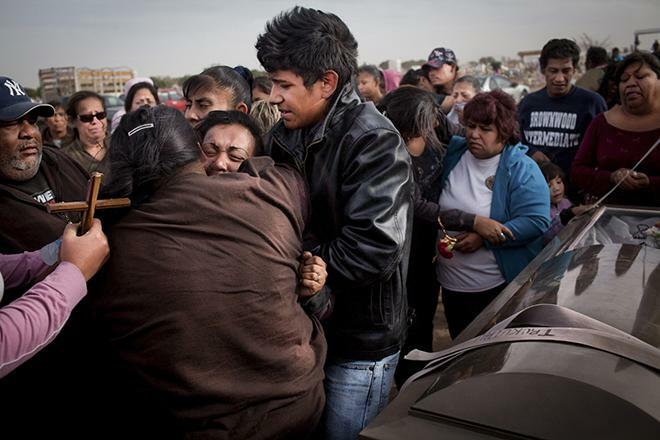 Family and friends attend the funerals of three female victims of a massacre that left 13 dead and more than a dozen wounded in Ciudad Juarez, Mexico, in 2010. Most of the victims were between 14 and 20 years old and were attending a birthday party. They were herded into a corner of the house and executed by a firing squad. Armed men came looking for one young man, but when the patrons responded that he was not there, they opened fire. I don’t cover the narco war. I don’t even pretend to. I’m a science writer: I go to labs, talk to scientists and policymakers, and occasionally get on boats that take me out to see cool underwater critters. I live in Mexico City, which is about as safe as living in Washington, D.C. I occasionally walk home a little drunk without worrying about my safety any more than I would have in my old home in Berkeley, Calif. And I gotta be honest, I’m happy in my little bubble. But working here, especially on occasional jaunts to northern Mexico, you can’t avoid the drug story. It’s infused in every interview, every stop at a checkpoint, every street corner, like that stink you can’t get out of the carpet. 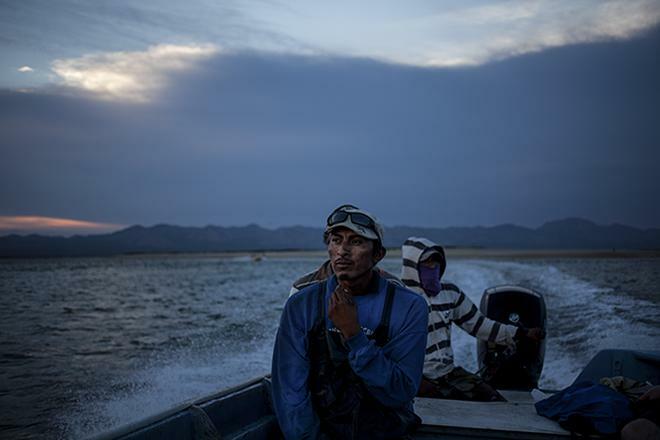 Last year I reported a fishing story in Sonora that attempted to put a human face on the seafood industry and the collapse of many populations of key ocean creatures. The idea was that if consumers knew more, they might make more informed choices about what they eat, maybe selecting slightly less destructive options. I was in a relatively quiet part of Mexico in terms of violence but one that is nonetheless a crucial stopover for drugs going north. To states like California, where I’m from. My reporting partner—a photographer named Dominic Bracco who’s spent his share of time amid drug violence—and I always thought it was funny that people in the area seemed incredulous that we were actually reporting about fish. Oh right, sure, “fish.” We have a lot of “fish” here. Fishermen are great mules because they know the waters and they don’t draw attention. And if you have to chuck your haul overboard to avoid the military, other fishermen can dive to retrieve it. This particular guy had a long run up the coast. In moments of dark humor, I imagine the people I know back home who do coke being on that boat with him. Any of them would have considered it the trip of a lifetime, posted photos all over the Web, and come home to great applause with wonderful stories to tell. I imagine them carrying home a couple trinkets to remember their Steinbeck-like voyage. Shrimpers catch a moment’s rest on their pangas while fishing in the Upper Gulf of California in 2012. This man did not. Maybe he endured storms and massive waves slamming his little panga while he clung for his life and prayed to get out alive. Maybe it was smooth going for a hundred miles, I don’t know. What I do know is that when he got to the end and he met the men who would take the cargo across the border, they put a bullet in his head and tossed him overboard to feed the fish he should have been catching. It’s cheaper to kill the mule than to pay him. When people back home do a line of coke, they call it a “bump.” It’s a marvel of the English language that something so horrible, so corrosive can have such a cute little name. I wonder what that fisherman would have said to that innocuous little word. “Glad I could help brighten the party,” maybe? The economics of cocaine trafficking are simple. South Americans make it, people in between move it, rich Americans buy it, and U.S. gun stores sell weapons back down the line to enforce this system. Everyone knows this. I submit that the drug trade—and specifically cocaine—is among the worst things that the human mind ever invented (which is saying a lot, since we are especially good at inventing horrible things). No one has good numbers on the death toll of a given drug trade. I called and asked a few think tanks how many people cocaine has killed over the past 100 years and got mostly bemused laughs. Ioan Grillo, author of El Narco: Inside Mexico’s Criminal Insurgency, has thought about this as much as anyone. When I asked him, all he could guess was a number with nine figures in it. Family members carry the remains of a municipal police officer who was executed in Ciudad Juarez, Mexico, in 2010. Just for fun, let’s try a back-of-the-envelope calculation. Around 60,000 were executed as witches during 150 years at the height of the Spanish Inquisition. Mexico alone has seen perhaps twice that many deaths during its seven-year drug war. From 1990 to 2010, Colombia had some 450,000 homicides, overwhelmingly due to coke. Add all the rest of Latin America (counting all the military actions that were driven by efforts to control trafficking routes as much as by politics), the U.S. share (15,000 per year on the high side, counting all kinds of drugs and overdoses and such). Now add an estimate of all the uncounted murders and overdoses and track that carnage back to the 1960s when the modern drug war began. The number starts to be in the league of the atrocities of Nazi Germany or American slavery. 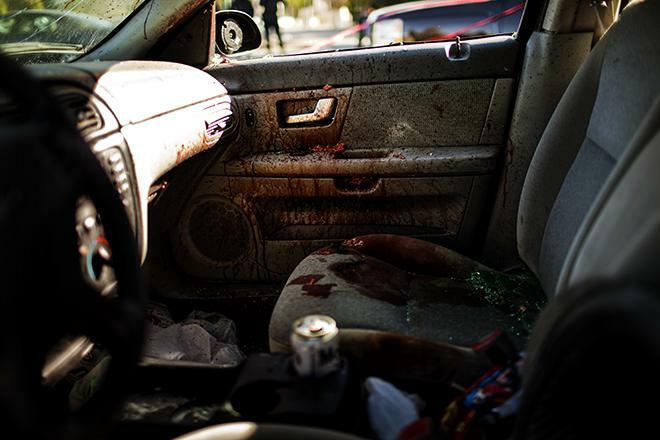 The place of death of three plainclothes police officers in Ciudad Juarez, Mexico, in 2010. So perhaps you can see why I sometimes feel a little silly covering the ocean fisheries crisis, telling people what’s not sustainable and why. It’s true, consumer choices are behind the ocean crisis. But you can eat sustainably every day of your life and give to charity every year, and it all gets wiped out with one line of coke. Who cares if you were a nice guy if in your spare time you burned witches? The Americans I know who indulge in cocaine are not bad people. Some of them even give money to charity. They’re just a little too bored, a little too rich, and a little too clueless. But if someone here in Mexico asks me who these people are—these people who support something that’s killing entire towns from Bolivia to Texas—well, I don’t know what to say. Hey, I mean, it’s just a little bump. Seri fishermen set off for a morning of fishing crab off the shores of Isla Tiburon in Sonora, Mexico, in 2012.